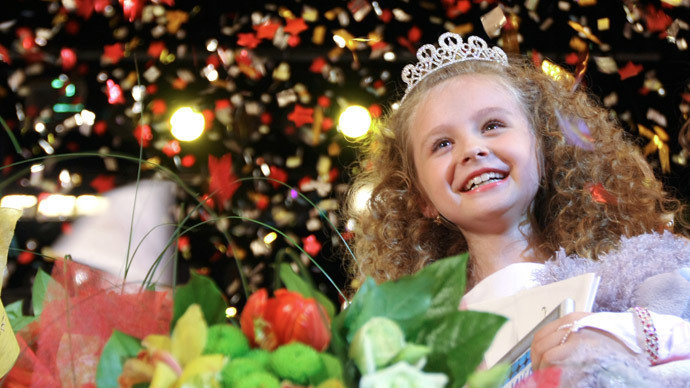 Deputies representing conservative center and nationalist parties have proposed a bill to ban child participation in beauty pageants and introduce tough fines for lawbreakers. Lawmakers from the United Russia party and the Liberal Democratic party have already submitted the bill to the Lower House, the State Duma press service reported on Friday. The draft outlaws child participation in any event where they will show themselves off and be judged on their appearance, if this could harm the child’s health or development physically, intellectually, psychically,and spiritually. Participation in contests that could potentially lead to corruption of the young is also banned. The authors explained the detailed definition was because they did not want to stop contests for children which do not include being judged by their appearance. The violation of this rule would carry a large fine. Parents or guardians who allow their children to participate in beauty pageants would have to pay from 4000 to 5000 roubles ($114 - $142). Officials who license such events face fines of between 40000 and 50000 ($1140-$1420) and companies organizing them – from 800000 to 1 million roubles ($22800 - $28500). Also a court could order such companies to suspend their work for up to three months. The bill introduces additional punishment for foreigners – apart from fines, foreign citizens can be detained for up to 15 days, and will be deported from the country. The sponsors of the draft said in the explanatory note that similar rules already exist in South Russia’s Krasnodar Region and also in France. In December last year St. Petersburg legislator Vitaly Milonov, known for his staunch anti-gay stance,announced his intention to press for a ban on child beauty pageants in the city. Milonov’s yet unfinished bill will apparently allow participation in beauty pageants only from the age of sixteen. Breaking the rule would be the responsibility of event organizers and of the participants’ parents. When promoting the move the lawmaker said that participation is such contests not only harms the child’s psyche, but also increases the danger of them becoming victims of paedophiles. Commenting on the new federal bill Milonov welcomed the decision as necessary, adding that many specialists claim that the growing number of child beauty pageants “leads to the over 20-fold increase in the number of people suffering from psychic disorders."